Breaking news !..Karmapa in Dharamsala, Tibetan Buddhist Teachings, Public talks, Tibetan Tours, Mantras and Meditation in Dalai Lama's Retreat ! 'The Living Amitabha Buddha'..the Prophecy of Buddha Sakyamuni, Meaning of his name, His Buddhist Activities in Dharamshala ! "Two thousands years after my passing, The teachings will spread in the land of the Red faced ones, Who will be the disciple of Avalokita. At that time, the bodhisattva Simhananda, known as "Karmapa" will appear. Possesing mastery over samadhi,he will tame beings And establish them in bliss through seeing, hearing, recalling and touching. Endowed with a name beginning with 'Ka' and ending with 'Ma', there will appear an individual who will illimunate the teachings"
What does Karmapa Name mean ?! In Buddhism history the name means "The one who carries out Buddhist activity" or the "Embodiment of the activities of Buddha". These spiritual lamas have incarnated in this form of nirmanakaya, or manifestation body for seventeen lifetimes, as of the present. 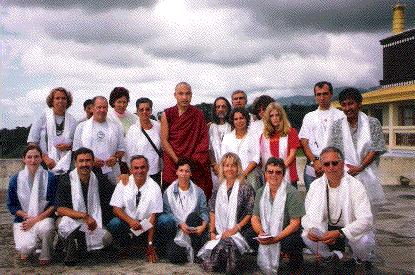 They all have played the most important role in preserving and propogating the Buddhist Teachings of Tibet. Throughout the centuries they have been the central figure in the continuation of the Vajrayana and Kagyu lineages. It is said that he has attained enlightenment long time ago as a Buddha in the past called Shenphen Namrol. He will be the sixth Buddha of this fortunate eon in the future who will be known as the Trukpa Senge and is inseparable with the present Buddha Sakyamuni. The great Indian saint Guru Padmasambhava and the great Brahmin Saraha are some of the most prominent manifestations of this Buddhist lineage. 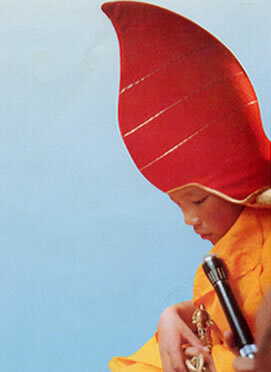 In 1985, a male infant was born into a nomad family in the Lahtok region of Eastern Tibet. In the months prior to his birth, his mother had wonderful dreams during her pregnancy. On the day of his birth a cuckoo landed on the tent on which he was born and a mysterious conch like sound was heard by many in the valley. These are considered auspicious according to Tibetan tradition. The young nomad was called Apo Gaga. In his early years he did not speak of any connection to the Karmapas. However in 1992 he asked his family to move their location to another valley and told them to expect the arrival of a High Lama. Soon after the High Lama 's followers, of this Buddhist lineage, came to that valley as per his secret instructions in the letter of prediction. Karmapa Living Buddhas belong to the oldest line of Tibetan Reincarnations back to the thirteenth century. The Mongolian Ruler, Kublai Khan is said to have presented the First Living Buddha with a Black Hat to mark His authority. After the death of the 16th Karmapa in November 1981, the search began for the present Reincarnation! His parents have told that their son would often ride on jackals and goats into the mountains alone.. " He built toy monasteries and a throne of stone and earth, where he would sit and recite prayers." The Amitabha Living Buddhas.."self recognized"
The 19th century Master Chogyur Lingpa made a number of predictions about the lives of the 'Karmapas' and since these predictions are fulfilled in themselves it is said, these Living Buddhas are 'Self recongnized'! Before the boy lama was chosen His Holiness the Dalai Lama had a vision, in which he saw green mountains covered with meadows and two streams where the name 'Karmapa' resounded in the air ! The Tia Situ Rimpoche's prediction.. In March 1992, the High Lama Tia Situ Rimpoche announced the discovery of the prophetic letter written by the 16th Amitabha, leading towards the Boy Lama in Eastern Tibet. There were many poems also predicting He would return back to the Tsurphu Monastery in His Reincarnate form ! The 17th Karmapa, Ogyen Drodul Trinley Dorjee returns to Tsurphu..! These Living Buddhas are the spiritual leaders of one of the four major Schools of Buddhism..the 'Kagyu School of Tibetan Buddhism'. In July 1992 His Holiness received his formal name in a traditional ceremony at the Jokhang Temple in Lhasa- 'Ogyen Drodul Trinley Dorjee'. Situ Rimpoche and Gyaltsap Rimpoche conducted the elaborate ceremony presenting His Holiness with a variety of blessed items sent by His Holiness the Dalai Lama and others. 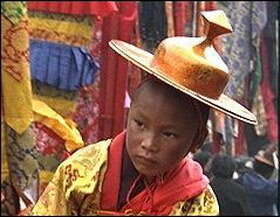 Restoring the Heart of Tibet's Cultural History..! On 27th September, 1992 the Beijing Government accepted the recognition of His Holiness as a reincarnate Lama with an official certificate when He was enthroned at Tolung, Tsurphu in Tibet..the main seat of all the Gyalwang Karmapas since the 12th century as per the "Tulku" traditions. During the religious ceremony the child 'Living Buddha' was enthroned and presented with a confirmation letter of His Holiness the Dalai Lama, a copy of the 'Dakhaishalcham' and the prediction of the Nechung Oracle which ratified the selection by the Sikkim Government. This traditional ceremony "Ngasol" consecrated the the seven year old Karmapa with the 'Eight Auspicious Symbols' along with an offering of the image of Buddha symbolising the Body,Long life Sutra Text and a Stupa symbolising the Mind. The ceremony was marked by a huge gathering of Tibetans, High Lamas and Dignitaries from Dharma Centers from all over the world. Two days later His Holiness the 17th Amitabha Buddha, performed his first empowerment by blessing the audience with the most beneficial and compassionate activity. It is said that a flock of Eagles circled in a clockwise direction along with the appearance of a horizontal rainbow above the monastery. 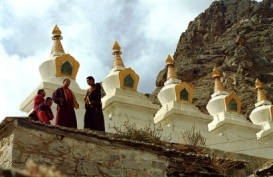 The monastery at Tsurphu underwent extensive restoration of temples, shrines , stupas in the presence of His Holiness. However as the years went by there was an increasing pressure from the Tibetan, Chinese authorities and recognising perhaps that His usefulness in Tibet was been undermined He decided to leave Tibet. After months of careful planning on December 28, 1999 the 14 year old Karmapa pretended to enter into a solitary retreat and instead donned civilian garb and slipped out of the window. Leaving the Monastery with a handful of attendants He began a daring heroic escape by car, foot, horseback, helicopter, tarin and taxi and arrived in the Northern State of Himachal Pradesh in Dharamsala in India on January 05th, 2000. He was greeted by His Holiness the Dalai Lama and given the Refugee status by the Indian Government. 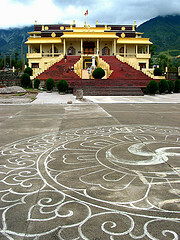 Currently His Holiness is residing in the Gyuto Ramoche Tantric Monastery in Dharamsala, India. He continues his Buddhist studies and by permission of the Indian Government annually travels to Bodhgaya and Sarnath to preside over important Kagyu ceremonies and teachings. His Holiness gives public audiences and teachings on selective days with pre-registration. For more information you can contact us !
" Coming from the son of the precious Buddha The smiling rays of luminous Dharma. Bring to blossom the lotus garden of the Sangha, the Supreme assembly. May the three realms reveal all their beauty in auspicious Glory. In this New Year may there be Peace and Prosperity on this Earth !! " Living Buddha Blessings for World Peace..! 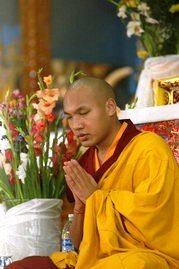 His Holiness the 17th Karmapa leads the prayers for World Peace as chief guest at the 2550th Buddha Jayanti Celebrations in Bodhgaya on 17th February, 2006. 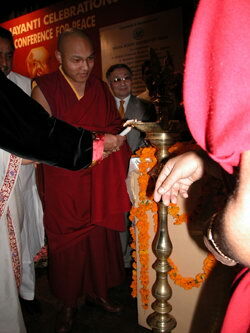 On April 07th, 2006 His Holiness HHK inaugrated the Global Conference for Peace by the traditional Lamp Lighting Ceremony. On April 07th, 2007 His Holiness with Tenga Rimpoche confers Chenresig Abhisheka..simplified teachings on putting use of Dharma in our daily lives. The Living Buddha with the 14th Dalai Lama at Sarnath on December 19, 2006 for imparting Teachings of Buddha Sakyamuni. 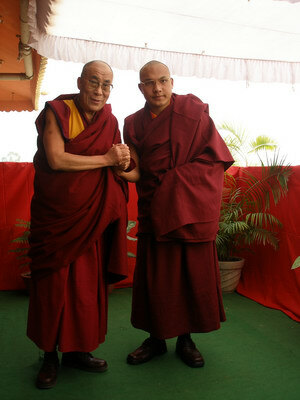 On June 26th, 2007 His Holiness Gyalwang Karmapa celebrated His 22nd Birthday in Dharamsala. On July 06th, 2007 the His Holiness visited the Dalai Lama's residence early morning to offer His good wishes and preside over His 72nd Birthday celebrations in Dharamsala. It was August , 1992..a young American tourist in my office at Yeti Travels, NEPAL, anxiously asking me for a trip to Tsurphu, Tibet. 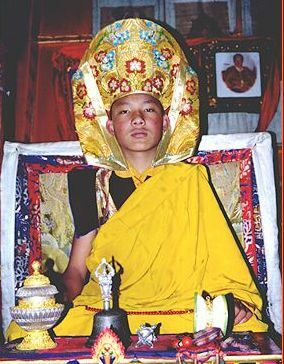 The occasion, the traditional "Ngasol" ceremony, in which the child reincarnate, 'Ogyen Drodul Trinley Dorjee', was being formally coronated as the 17th Karmapa of Tibet, by the Chinese authorities, High Lamas of Tibet and by a confirmation letter of His Holiness the Dalai Lama -'Dakhaishalcham', as per "Tulku" traditions. This was in acceptance with the prediction of the honoured Tia Situ Rimpoche (Sikkim). This ceremony was taking place at the Tolung, Tsurphu Monastery in Tibet. I was bewildered, as I was not aware of this place. However, it was a challenge which appealed to my sense of originality. By the end of it, I had a group of 35 people from different nationalities, all eager to witness this historical event ! I had a program, but getting a Tibet group visa was the ultimate hurdle, but the visas were through, one hour before the groups departure to Lhasa, thanks to Buddha ! Many times while doing holiday programs for my guests, I have sometimes opted for off-the track itineraries! Our best bet of living life on a different level of 'thrill' and 'high' would be simply, to accept challenges when they come along! For your exciting unique journeys in the mountains of India, Nepal, Bhutan & Tibet...Contact Us !